Last year we finished our Apologia science book early so I needed a new science to fill in the gap. And I wanted a completely different change of pace for the rest of our school year-I did not want to head straight into another Apologia book. So, I chose Nancy Larson Science (NL). We didn’t finish it over the spring due to moving, so we’re working on our final units this fall. Do I like it? NL is the polar opposite of Apologia. Apologia is one text with full color pictures and an overload of information on one specific science topic. Apologia also publishes a notebooking journal for taking simple notes and drawing pictures of the information learned. Each lesson has one or two experiments using mostly household items. In NL, multiple topics are covered over the year and everything is included within the kit. You receive a teacher’s manual of scripted lessons, a student packet with worksheets and short books for them to read and illustrate. Items for experiments and hands-on study are included as well as a few science picture books that are scheduled throughout the program. It’s all there for you! In the teacher’s manual, bolded text is what is read to the student. The manual also includes possible student responses following the bolded text. There are also a few additional notes to teachers, prompts to tell you when to use certain supplies, and instructions on when to read pages out of the picture books or in the included booklets. The last page of each lesson prompts the teacher to ask the student what he/she learned and also outlines which review page to have the student complete. The worksheets for level 1 require very little writing. They usually have either multiple choice, true/false, short fill-in-the-blank, or a space to illustrate an answer. The program suggests using the worksheets following the lesson or having the student complete the review sheet the following day at the beginning of the new lesson. We completed ours the day after the lesson to make sure Curly was still retaining the information. Each unit has a short booklet that has several paragraphs of text for each topic within that unit. Many pages also had a place for the student to illustrate a picture based on the lesson. The booklets are meant to be read together. Because Curly is a strong reader, I had her read most of the paragraphs to me. We then underlined key words and completed the illustration sections. A few booklet pages were more of a worksheet format. The text of the booklets is very simple but contains many of the vocabulary words introduced in the program. Level 1 also contains many picture cards of animals studied in the program. The program also included habit cards to go along with the zoology study. Sometimes I felt like there just wasn’t enough information for each week. I felt like we only scratched the surface on each topic. After diving deeply into one topic through Apologia, I had the nagging feeling that there were unanswered questions and I was left wanting more. The first unit was incredibly simple-we learned about life stages of humans. Humans are infants and then toddlers……..etc. I was disappointed with the simplicity. The projects are more hands-on activities and less actual science experiments. We spent more time observing and collecting and touching and exploring rather than conducting experiments. Each day has a review worksheet to complete so there are lots and lots of worksheets included with the program. I’m ok with worksheets sometimes…..but I wondered if we were just doing busywork. The lessons are very, very scripted and sometimes I felt silly reading the little script as I taught. I don’t mind scripted lessons but this was scripted right down to “Turn to page 3 in your booklet.” “What does the title say?” The script also has prompts like “Allow your child time to complete the illustration on page 8.” I’m not sure if I need that much help….Every single word that you could possibly need to say is included in the script. NL is a program that will break your homeschool budget! Now, everything is included so there are no frantic trips for science experiment materials and very few outside materials or resources are required to complete the program. So, NL is a one time purchase for your science curriculum and supplies without the weekly supply trips. Maybe if you broke it down it is cheaper in the long run, but upfront it can be expensive. The student materials are not reproducible for use within a single family. They would have to be purchased separately for each student. I so wish I could copy a few pages for Tiger rather than buy an entire new set of materials. Science got done-almost every day. The lessons take only a short amount of time and are easy to complete. I just pull out my tub of science supplies and everything is right there. Need a pinecone to observe? It’s in there! Time to read from the outside source? It’s included-no library trip for me! Curly’s retention was amazing! Because the lessons are so incremental and all the information is broken down into bite sized pieces, she was able to piece things together and remember all the details we covered. She aced every review worksheet and had no complaints completing them. They were very age-level-appropriate for her abilities. I never felt like we had information overload and the information presented progressed in such a way that topics built on each other. Curly liked reading from the booklets provided by the program. She would read her short paragraphs and then illustrate her page. She liked the booklets-they were enough without being too daunting to complete. Curly liked to read through them and underline key words as she read. I could see how this program promoted research skills and encouraged reading fluency, reading comprehension, observation skills, and narration. Some days I was thankful for the script to make sure I wasn’t missing anything. Although I had never used a program that was scripted down to every little word, it made the program completely open-and-go for me. Then when you include the box of supplies-everything is done for you! I really enjoyed spending several weeks on one topic and then having a change of pace as we switched to something else. After spending an entire semester on one science topic, I was thankful for the wide variety. NL was such a welcome change! Would I use Nancy Larson again? Hmmm….I’ve been debating about science for next year. My kids enjoy reading through the Apologia books and looking at the pictures. They are great reference materials, so I think we’ll have to keep purchasing them. I’m planning to try a completely new science this spring-Elemental Science. We’ll see how that turns out! My kids have been really enjoying science so I think we’re going to use multiple programs throughout the year to keep them busy! I like the mixture of approaches and activities. But as for Nancy Larson….yes, I think I would try it again! It’s science that’s incremental, meets my kids at their learning level, is laid out completely, and is easy to complete. Science gets done. Science is retained. The kids ask for more. The variety of topics keeps us interested. All the hands-on activities are very easy to complete and don’t require tons of items and a long setup time. The worksheets are short and not too challenging. The script is helpful when I haven’t had time to glance ahead. The little booklets to be read and completed by the students are fun for Curly to work on. I like that outside reading is included with the program. So, for me, I think the many things I enjoy about the program outweigh some of the things that I’m not sure I like. I really like Nancy Larson Science, my box of supplies, and the incremental approach! But if we use this science again, I think I will plan to purchase a few additional outside reading materials for each topic. 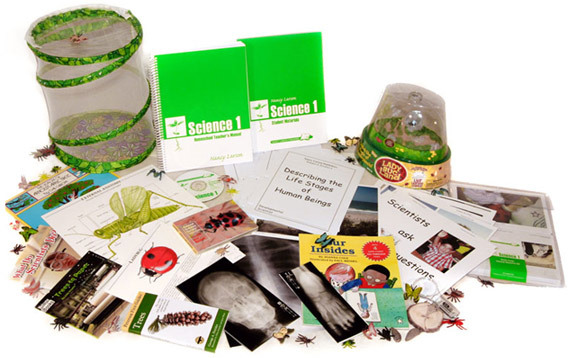 I don’t want to make lots of library trips-I’d rather have everything in my little science box. But I also feel like Curly was ready for just a little bit more information on each topic because the science lessons really drew her in and piqued her interest. I think we both need just a little bit more. *I learned that if you contact the company, they will send you a list of additional extension projects for each lesson as well as an additional booklist. I plan to use the list and purchase a few key books for each unit to have more sources. I will also find a science encyclopedia that’s age-level appropriate. I think those additional resources will make the program feel more rounded for me and satisfy my bookworm children. You can preview samples of Nancy Larson Science here and it can be purchased here for $225 plus shipping. Disclaimer: This is a product that I purchased to use with my kids. I was not asked by the company to review the product or tell about our experience. All opinions are mine. Thank you for taking the time to write this detailed review, it is very helpful!